Last weekend I went camping for the first time in 14 years. The ocean was a five minute walk from the campground, and we could hear the lapping of waves at night. One day I walked down to the beach and sat for a couple hours staring at the water. My life has been extremely busy and exhausting the last several weeks, and I needed to just sit and let my mind wander without trying to accomplish anything. There was no one around except me and the wind, and I found myself spontaneously singing a Tibetan Buddhist chant, "Om Mani Padme", which means the jewel in the lotus. Suddenly I remembered that I had my MP3 player in my backpack, and that particular song was on it. Within a few minutes I was playing, splashing, and dancing in the water accompanied by Om Mani Padme. I turned 44 years old earlier this week. It was very much a bird birthday! I received many owl- and bird-themed gifts, like an owl towel from Cory, owl bandages and a bird calendar from Hilary. Aren't those bandages a hoot? (Sorry, I couldn't resist.) While camping, my family surprised me one evening with a chocolate cake and candles. They sang happy birthday and spoiled me with presents. I was a happy camper. Another birthday treat occurred later in the week when my co-workers took me out to lunch at Applebee's and the waitress sang happy birthday to me in Italian. It was gorgeous. A sweet blogger friend sent me a package of bird goodies in the mail for my birthday, including this vintage crocheted owl. Isn't it adorable? I'm still trying to decide where to hang it. 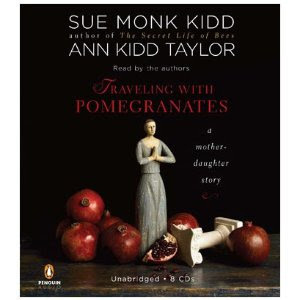 I'm listening to the audio book Traveling with Pomegranates by Sue Monk Kidd and her daughter Ann. Sue is the author of The Secret Life of Bees. The book is a memoir of her and Ann's journey to Greece as Sue struggles with her upcoming 50th birthday and Ann deals with depression over the loss of a dream. It is also about mothers and daughters and there is a strong spiritual theme. It's a little slow, but rich and textured and inspired. 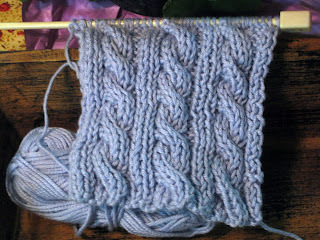 I'm working on a reversible cable scarf in a soft cotton and silk blend yarn. Cables are still a bit of a novelty, and although this pattern is quite simple, I'm enjoying it very much. I've been wanting to knit a cabled scarf ever since I saw Cinder over at Brooklyn Tweed. Happy Birthday my friend! Sounds like a wonderful and relaxing time at the beach! I haven't camped in a long time but just might have to do that when it cools off a little more! Enjoy your day with all of those sweet gifts! How wonderful to dance and sing on the beach! Glad that your birthday was nice and fun owl treasures! Have you started your ATC for this month? I haven't.. Happy Belated Birthday! Sounds like you had a wonderful time -- especially at the beach. 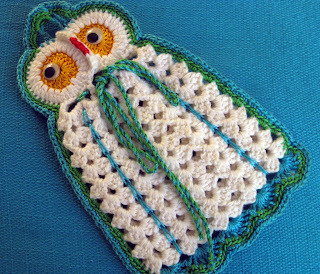 That owl potholder is FANTASTIC -- you should re-create the pattern. ;) And your scarf is really pretty. It reminds me of the Irish Hiking Scarf pattern -- I love mine! Oh, goodie. I have been waiting patiently for you blog post on your beach camping weekend. Love the pictures of the ocean and birds. Everyone sure knows that you are a bird lover. Oh, those wonderful owls. I hope this weekend is fun and restful for you. There is nothing like a visit to the ocean to get recentered. Your visit sounds lovely. Love the scarf. Must go find it on Rav! Happy Birthday! I can just sit and watch the waves for hours, although I don't usually get the chance to do so. During the fall on Lake Erie I imagine I am on the ocean. The breezes are stronger, the sound of the surf louder - completely mesmerizing. Hope you had a great 44th and many more. I remember my 40s but I have to tell my 50s were much better. I made that scarf and it comes out great.